Maceday and Lotus are both all sports lakes and are connected for a total acreage of 419 acres. 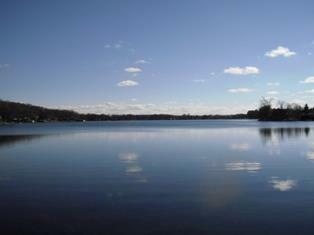 Maceday Lake is located in Waterford, Michigan. The majority of Lotus Lake is located in Waterford Township, but the northern tip falls into Independence Township (more commonly known as Clarkston). There is a public access site at Williams Lake Rd just east of Maceday Lake Rd. Maceday and Lotus Lakes are all sports lakes- great for the water skier or jet skier in the summer and snowmobiler in the winter. For the fisherman, Maceday Lake is a designated trout lake and was stocked last fall with 1,000 lake trout with some of the fish being up to 18 inches long and ranging in age from 2-4 years. Maceday Lake was also stocked with 12,000 rainbow trout in 2010 and another 12,760 rainbow trout in April, 2010. It was stocked with 15,000 splake (brook trout/lake trout cross) in March of 2009 and 13,300 in April of 2010. Scroll down for Lotus and Maceday sales by year. Please don't hesitate to contact me if you are considering buying or selling a home on all sports Maceday Lake or Lotus Lake.